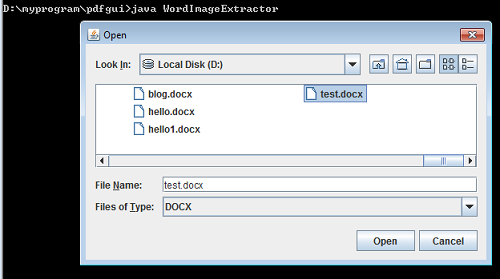 WordImageExtractor is able to extract all images in a microsoft word 2007+ file. The Java library that is used to extract the images from the microsoft word 2007+ file is Apache POI. In this libray, there is a class called XWPFDocument. The XWPFDocument class has the getAllPictures method that can extract all images in the file to store in a list. In the code above, the JFileChooser is used to display a file dialog that the users can easily browse for a Microsoft Word file. Once, the path of the file is obtained, the extracting image process can start. The FileInputStream class reads the byte data of the Microsoft Word file. To get images from the original Microsoft Word file, firstly you need to construct a Microsoft Word document object by using the XWPFDocument and pass the FileInputStream object to its constructor. Once you have document object, it seems like the original Microsoft Word file now is in you hand so you can do somethings with it. To get the images from the document, you will use the getAllPictures method. This method returns a lit of XWPFPictureData objects. Each XWPFPictureData object refer to an image. You can read all bytes from the XWPFPictureData object by using the getData. When you have the byte array of the image, you can construct the BufferedImage object from it. Then use the write method of the ImageIO class to write the image out to a file. I'm not a developer, i always use the free online ocr to recognize and scan text from image. I have a docx file include paragraph, table, picture. I want to convert this to a html file. How I extract picture and true position of it?